These days, more and more dogs are suffering from allergies and food intolerances. Grains containing gluten (e.g., wheat or corn), artificial colouring, or flavour enhancers may be the reason for this development. In response, we at Nutricanis have developed a grain-free/cereal-free dog food in collaboration with veterinarians and feed specialists. 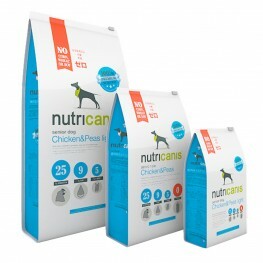 Nutricanis dry food for dogs contains no grain and gluten, no artificial colours, flavours, and flavour enhancers, no sugar, no cheap fillers, and no slaughterhouse waste. Our grain-free/cereal-free dry food for dogs is made from high-quality ingredients such as chicken, carbohydrates from potatoes, vegetables, and fine herbs. 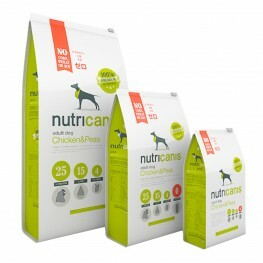 Nutricanis dry food supplies your dog with everything he needs on a daily basis. As a premium dog food specialist, we refrain from using anything that does not contribute to the healthy diet of your dog. For Nutricanis, 'premium' means using high-quality ingredients.